The US labor market continues to grow at a blistering pace. According to the BLS, in August the number of job openings in the US hit a new all time high of 7.136 million, up from July's prior upward revised record of 7.077 million. More importantly, August was the fifth consecutive month in which total job openings surpassed the number of unemployed Americans, which last month declined to 5.964 million. 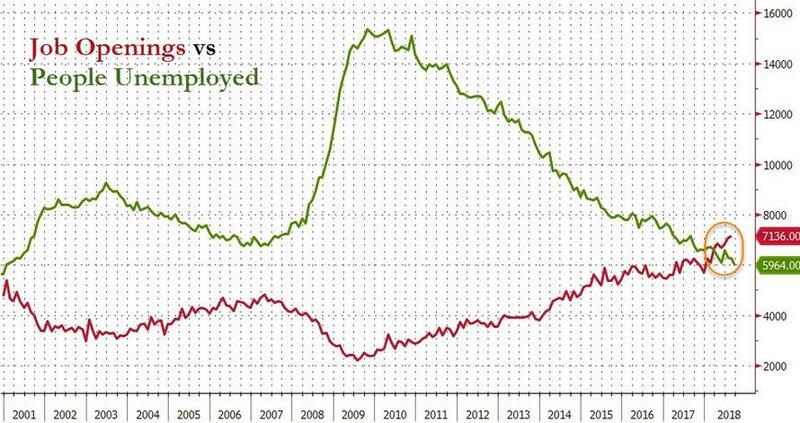 This means that there are now 1.2 million more job openings than unemployed Americans who are seeking a job (how accurate the BLS data is, is another matter entirely). Adding to the exuberant labor picture, while job openings remained above total unemployment, the number of total hires also increased to a new record high, rising to 5.784 million in August from 5.713 million in July. 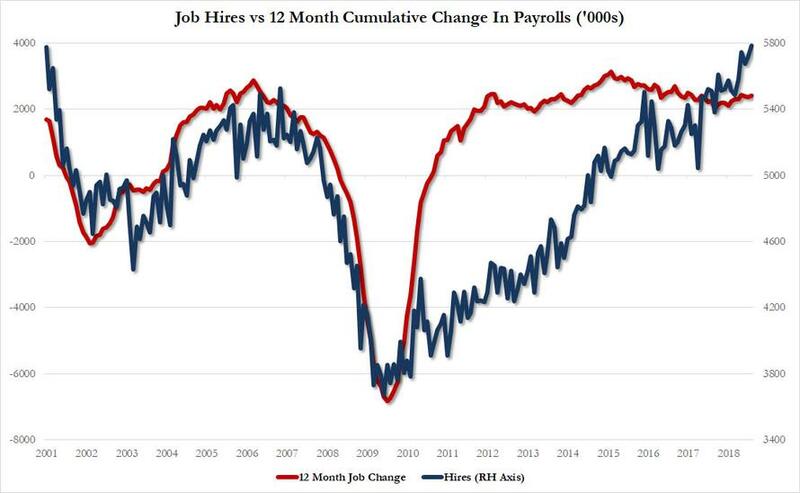 According to the historical correlation between the number of hires and the 12 month cumulative job change (per the Establishment Survey), either the pace of hiring needs to drop, or else the number of new jobs will rise significantly in the coming months. Meanwhile, looking at the number of quits - the so-called "take this jobs and shove it" indicator - which shows worker confidence that they can leave their current job and find a better paying job elsewhere, revealed that one month after hitting an all time high, there was a modest, -31,000 dip to 3.577 million in August, further confirmation that Americans are increasingly confident in their job prospects should their part ways with their current employer. 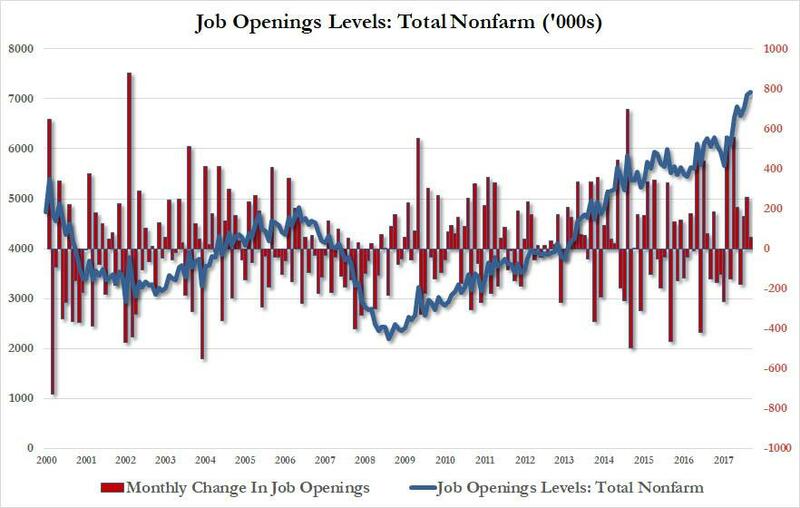 Job openings have increased since a low in July 2009. They returned to the prerecession level in March 2014 and surpassed the prerecession peak in August 2014. There were 7.1 million open jobs on the last business day of August 2018. Hires have increased since a low in June 2009 and have surpassed prerecession levels. In August 2018, there were 5.8 million hires. 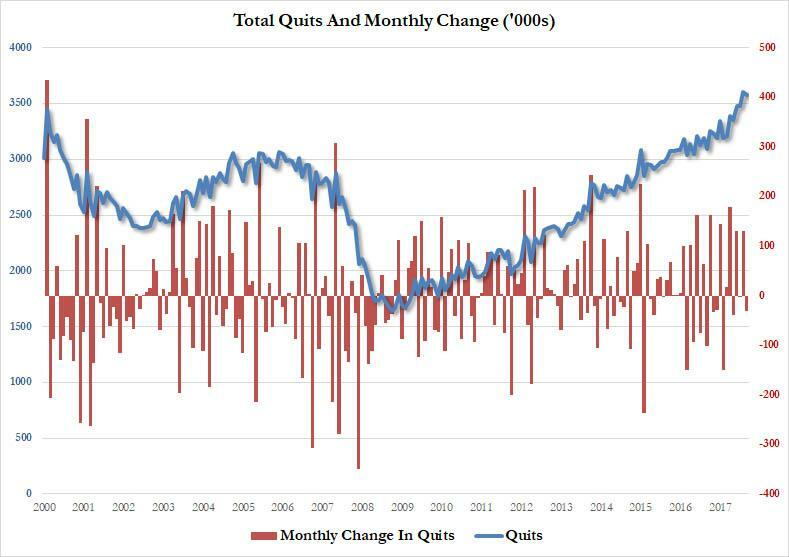 Quits have increased since a low in September 2009 and have surpassed prerecession levels. In August 2018, there were 3.6 million quits. 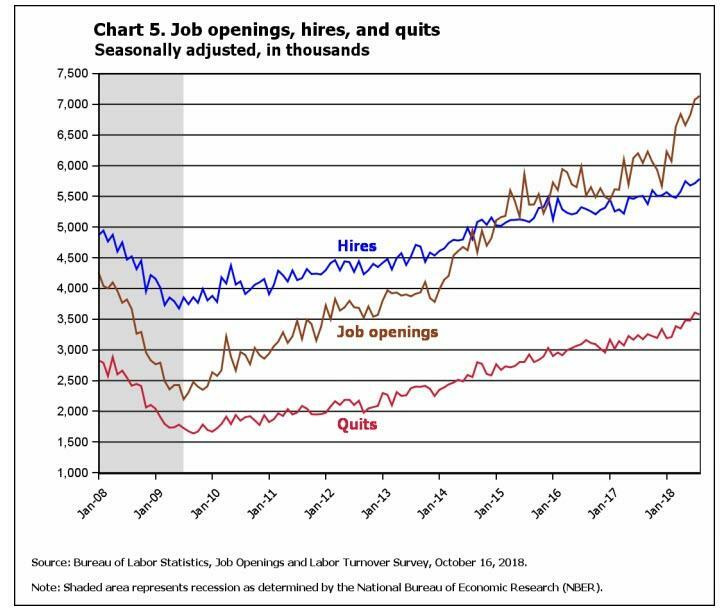 For most of the JOLTS history, the number of hires (measured throughout the month) has exceeded the number of job openings (measured only on the last business day of the month). Since January 2015, however, this relationship has reversed with job openings outnumbering hires in most months.